RANDOM ENTERTAINMENT: RON ARTEST WILL BECOME A LOS ANGELES LAKER!!!!!! GOODBYE TO TREVOR! RON ARTEST WILL BECOME A LOS ANGELES LAKER!!!!!! GOODBYE TO TREVOR! LakerNation I begin this blog with a heavy heart, for one Trevor Ariza! Let me be clear from the beginning, I only wanted to see Trevor Ariza in a Lakers uniform for a long time to come, and on this 2 day of free agency we have found out that will NOT be. Trevor Ariza has just agreed in principle to a deal reportedly worth $32mil with….THE HOUSTON ROCKETS? Trevor took the full mid level exception from the Rockets and will begin his tenure as a Houston Rocket in 2009-2010 season. LakerNation it really was hard for me to just wrap my mind around this. Trevor Ariza’s agent David Lee has done a TREMENDOUS disservice to his client. He attempted to come at the Lakers in the same manner he did last year when the Lakers were looking to sign Andrew Bynum to an extension, but what he did not understand was Bynum is a rare Center with great potential, but small forwards who have been CONSISTENT for years were very much available and willing to play for the NBA Champion Lakers! So David Lee played hard ball and now Trevor is with a team, who is not sure what it’s future holds for the upcoming season…but hey at least he is paid! And to think of that he took the mid level exception, isn’t that what the Lakers offered him?Yes it was, so because the Lakers offered you what the league wide value was for you on top of putting you in the starting line-up on a championship caliber team, and gave you a chance to shine and showcase your skills, the mid level was “a slap in the face”…I don’t get it! But Trevor I am not blaming you, your stock was high this year and this is a business, but I am disappointed that you chose to take this personally, and go with Houston, who is giving you the same thing the Lakers offered you to stay! So we say goodbye to a very gifted and talented player in Trevor Ariza do well in Houston (except against us…lol)! Hello Ron “Tru Warrior” Artest..you are about to be a Los Angeles Lakers! Now I mentioned Artest as a possible replacement if Trevor decided to go elsewhere, but I never imagined we would get him at such a deal…3yrs $18mil…The Lakers just one-upped every trade done to date! 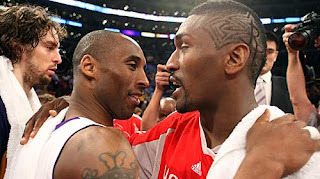 In acquiring Ron Artest the Lakers lose nothing from the basketball aspect, but they do gain someone that has been labeled a “problem child”, but truthfully he has not been that way since the Indiana incident. He also is not considered a “bad teammate”. Ex-teammates of Ron, has never spoken ill of him…so that tells me that he knows how to act on the court and in the locker room, and that’s all that matters to the Champs! So I will not make this “too long” of a post: Simply welcome Ron some of us have been long awaiting your arrival, and get ready for your first NBA Championship!